This is the first children’s book I’m reviewing, and it’s well worth checking out. It’s written especially for Christian families, but I think its message would be appealing to any religious group if adults make slight adjustments as they read to children. THE PLOT: Thaniel the Spaniel has been hearing stories his whole life about the night Jesus was born. He feels left out and inadequate next to his other animal friends, who all gave gifts to the baby. As time goes by, though, Thaniel learns that his own special qualities are gifts he can continue to give every day. MY TWO CENTS: It’s been many years since I considered myself a religious person…and the end of this book choked me up. I’m not even kidding. I truly felt like I was reading someone who gets it, who really understands the true meaning of Christianity. If you are Christian, this would be a beautiful story for your children to grow up with. I think non-Christian parents could also slightly adapt the book as they read to children. After all, the message of service to and care of your fellow humans is universal, and a very worthwhile message to pass on to children. For instance, think of Charlotte’s Web. Its message isn’t specifically Christian, but the idea of sacrificing for your friends is common to many religious beliefs. 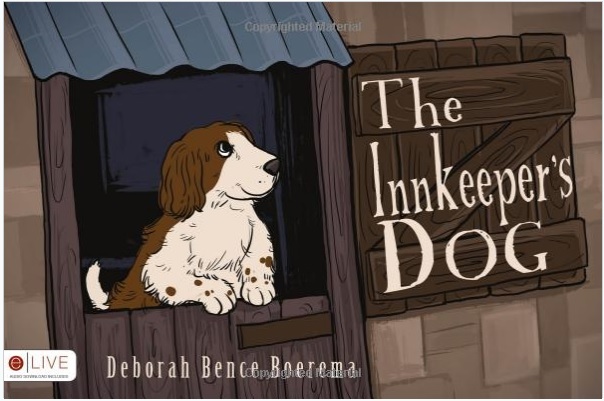 Finally, I love that The Innkeeper’s Dog has a dog as the main character. Awww, puppies! The illustrations are very sweet and children will enjoy looking at them. NOTE: Some activities related to the book are available here under the “Lessons from Thaniel” tab. BOTTOM LINE: A perfect children’s story for Christmas, or really any time of year. Start a new family tradition with this book. TEACUP RATING: Absolutely 5+ out of 5 teacups. Incorporate reading into an afternoon teatime with your children to nurture their love of reading.